Posted on December 28, 2018 by admin | Comments Off on BONUS Game Day! That’s right, folks! To celebrate the new year, we’re going to have a BONUS All Day Game Day at 2 Flights Up on New Years Day from 1PM to 9PM. Did you get a new game for Christmas? Bring it on up and let’s get it to the table! We don’t have anything scheduled – it’s just open gaming all day long. 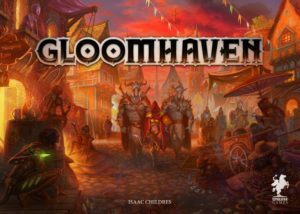 Rumor has it though, that the award-winning Gloomhaven might be making an appearance. If dungeon crawls aren’t you thing, though, we’ve got over 270 games to choose from, Euros to Amerithrash to train games to party games and traditional family games. So come on up and see how much fun you can have at a table!